ONGC Rajasthan Recruitment 2019 - Below are various recruitment notifications published by Oil and Natural Gas Corporation Limited, Rajasthan. As of now, we don't have any active recruitment notification by ONGC Rajasthan featured here. We may update as soon as the organization announces a new job notification. If you are looking for any information related to previously organized recruitment drives by ONGC Rajasthan, you can browse through previous job notifications mentioned below and get the new updates or information you are looking for. ONGC Rajasthan Recruitment 2019 - Apply Online for Apply Online for 10 Non-Executives Posts in ONGC Rajasthan, Rajasthan on Regular Basis. 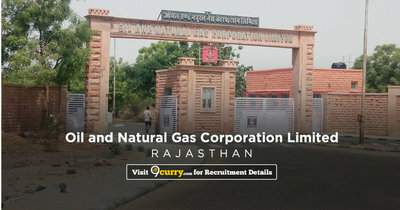 Online Applications are invited by Oil and Natural Gas Corporation Limited, Rajasthan from 31 Jan 2019 to 20 Feb 2019 for 10 vacancies. High School or Class X Equivalent Board Examinations with Science and Trade Certificate in Fitting Trade. Eligible candidates may apply online at ONGC Rajasthan's website (direct link is given below) from 31 Jan 2019 to 20 Feb 2019.